Do Grandparents Have Visitation Rights in Florida? You may be surprised to hear that, under certain very limited circumstances, grandparents do have visitation rights in Florida. However, it is important to note that visitation rights are only granted to grandparents in Florida under a very narrow set of circumstances. This article provides a brief overview of how grandparent visitation rights are awarded in Florida. Any grandparent interested in pursuing visitation rights are encouraged to consult with a local timesharing attorney without delay. The child’s other parent has been convicted of a felony or an offense of violence evincing behavior that poses a substantial threat of harm to the minor child’s health or welfare. So how does a Florida grandparent go about obtaining visitation rights in Florida? Step one is to file a petition for visitation. After this petition has been filed the court will hold a preliminary hearing in order to determine whether or not there is a prima facie showing of parental unfitness or significant harm to the child. If the court finds that there is sufficient evidence then the court may appoint a guardian ad litem and refer the matter to family mediation. If the family is not able to sort out the grandparent visitation matter with the help of a mediator then the court will hold a final hearing in order to resolve the visitation issue. During this final hearing the court assesses whether grandparent visitation is in the best interest of the child and whether such visitation will materially harm the parent-child relationship. This process may sound confusing, but don’t worry, a local family law attorney will be able to guide you through the entire process step-by-step. Are you a grandparent who is interested in enforcing your visitation rights in Florida? If so, experienced family law attorney David L. Hirschberg is here to help. Here at the Law Offices of David L. Hirschberg, P.A. we are committed to providing exceptional service and top caliber representation to each and every one of our clients. 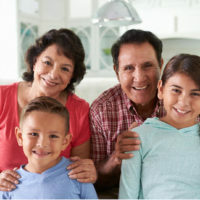 We understand the important role that a grandparent can play in a child’s life and fight tirelessly to enforce the visitation rights that our grandparent clients are legally entitled to. If you’d like to discuss your legal options with one of our experienced family law attorneys during a confidential consultation contact our Boca Raton office today at (561) 288-8620. © 2016 - 2019 Law Offices of David L. Hirschberg, P.A. All rights reserved.